Autumn is my favorite season. 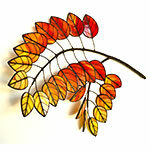 All the fall colors have a powerful influence on the items I create. The glass I chose is a mix of Yellow and Red Variations. Each leaf segment was cut at an angle to the grain to resemble the natural veining in found in an actual leaf.